An oral radiology source for dental professionals. 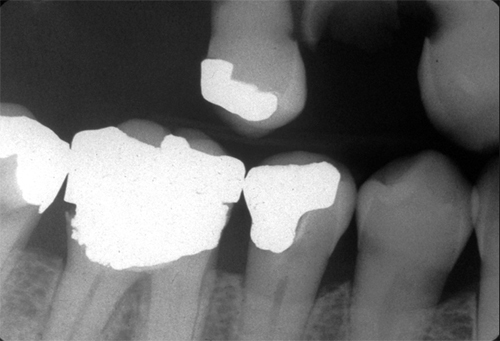 Now this post will be fairly short as root caries are more commonly seen intraorally then on radiographs. Larger lesions with loss of tooth structure will be evident on radiographs. Note the loss of tooth structure apical to the cemento-enamel junction of the maxillary canine. One thing to be aware of when evaluating for root caries is cervical burnout. Cervical burnout presents as a diffuse radiolucent area on the interproximal surfaces of the root apical to the cemento-enamel junction. This is created by decreased x ray attenuation of the cementum as it is very thin and unable to stop x rays from reaching the image receptor. 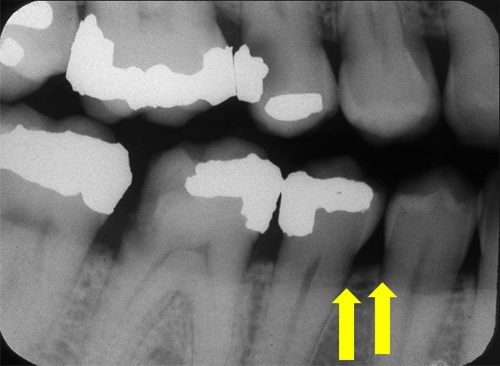 Note the yellow arrows pointing to diffuse radiolucent areas on the interproximal surfaces of the tooth. There is no loss of tooth structure and this radiolucent area extends apically to the bone indicating cervical burnout. Practice examples coming later today. If you have any questions or comments, please leave them below. Thanks and enjoy! This site is an educational resource about oral and maxillofacial radiology. This information is meant as a learning tool and not a diagnostic tool. Any and all diagnoses should be made by your personal physician or dentist after reviewing clinical and radiographic findings and medical and dental health history. The views expressed in this blog/website are my own and do not reflect the views of my employer.